﻿ It’s been a wild time to be in Five Finger Death Punch lately. Between legal issues with their label Prospect Park and Ivan Moody almost singlehandedly running the band into the ground, what was once seen as one of modern metal’s pillars of strength has seldom seemed so vulnerable and unsure. It’s not as if this has been a long time coming either; for as much of a gigantic cluster of inconsistency that 2015’s Got Your Six was, it’s still a fairly solid listen overall (albeit far from the band’s best), and saw a band at least ploughing on with the mountainous success they had garnered up to that point. In the run-up to And Justice For None though, we’ve seen a band trying to put forward some kind of reassurance that they’re the same, with all the gnawing latent insecurities proving otherwise. And it would be wonderful to say that’s not the case for the entire album, it really would; Five Finger Death Punch have long been able to prove they’re more than capable of writing a storming straight-up metal song, and while And Justice For None does do that, it’s never enough to stop those insecurities from being an inescapable presence. Even though that’s been a criticism levelled at this band for years now, the context of the past couple of years alongside what they’re trying to say paints this as a deeply unstable and paranoid listen, the extent of which is hard to avoid. It’s worth looking at Moody’s presence on this album first, and and how his swaggering, tough-guy persona comes across as more of an act than ever. He struggles to even mask it this time around too; of course, there’s the typical tactic of throwing punches in the dark towards unnamed haters on Fake and Rock Bottom, but the deeper layers come in the views of himself, and how clearly tired and jaded towards fame that he is. And this can be potent to focus on, and when stripped back to the slower, more sombre ballad I Refuse or the open acknowledgement of his clear faults on Stuck In My Ways, there’s genuine weight and pathos there. But it’s when Moody reaches his most confrontational and defensive that things really go off the rails, with tracks like Top Of The World and Sham Pain deflecting his issues onto his fanbase, and blaming them for the problems that he knows are there and won’t try to solve himself. And thus, the cycle continues, where the only way for Moody to deal with his insecurities is by lashing out, and subsequently splintering his fanbase into pieces like what’s currently happening. It’s just an ugly sentiment overall, with Moody trying to sidestep opening up and working on his own vices by shouldering the blame on bystanders with next to no self-awareness of the repercussions of it all. And what’s even worse is that, framed as Five Finger Death Punch’s unashamedly towering, angsty metal beatdown, it does sort of work. More likely than not, And Justice For None will be viewed as little more than another meaty slab of mosh-fodder with little to constitute depth or substance, and from that perspective, it’s totally fine for the most part. They’re still perfectly capable of dishing out some weapons-grade chug, and turning your brain off for Fire In The Hole and It Doesn’t Matter becomes a perfectly acceptable way of getting the most enjoyment from them. As always though, it’s their slower moments that really accel the most, with When The Seasons Change and a churning, snarling cover of Kenny Wayne Shepherd’s Blue On Black letting Moody fall back on the smoother, more emotional register that always fares the best for him. Sure, bringing back their rendition of The Offspring’s Gone Away from last year’s greatest hits compilation couldn’t feel more perfunctory, but overall, And Justice For None is a predictably reliable instrumental effort from a band who’ve long made this their oeuvre. It’s just a shame the rest is so unlikable, not only taking the controversy that’s plagued them lately and trying to spin it in a way that absolves Moody of any blame, but doing so in a way that’s not believable in the slightest. Even sticking to their dumb but ultimately filling usual tricks would’ve been preferable to this, watching a band put up as many walls as they can, and coming across as more defensive and outwardly posturing than ever before. It’s just about saved from being outright bad by a tolerable instrumental performance, but And Justice For None looks to be the start of Five Finger Death Punch’s tailspin. They’ve already dismantled their own career in the eyes of so many, so only time will tell if they’ll be able to pick things up once again. 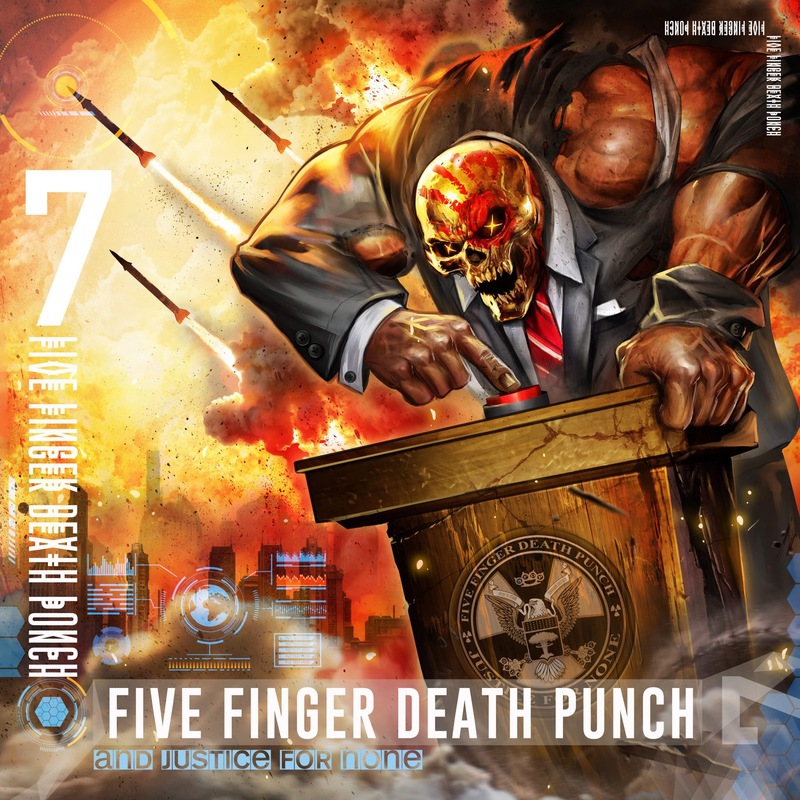 ‘And Justice For None’ by Five Finger Death Punch is out now on Eleven Seven Music.